We specialise in monitoring systems (SCADA) for food processing, storage and transportation, hospitals, universities, and the pharmaceutical industries. 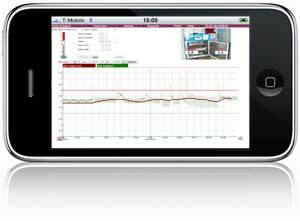 AAW's product portfolio includes wired and wireless monitoring systems optimised for ease of use and complete management over the Internet and mobile network. All our systems are IP based and can be used and administered anywhere a network connection is available. Individual systems can be combined and expanded to practically limitless size despite independent systems in different locations. Our bespoke systems can be customized on a client's request via CAD drawings and equipment photographs making the system instantly recognisable to new users. Our unique user interface has been designed around customer feedback to provide ease of use and functionality unrivalled by other systems; interface elements are large and easy to read, new users feel instantly at home with the mouse driven operation and bold visual alerts. For customers with very basic requirements we can supply a 'RIOT' (Remote Input Output Transceiver) or a SCUFFLE (Supervisory Control Unit For Flexible Logging Environments) monitoring system. Designed with simplicity in mind the RIOT can monitor up to 32 wired inputs or up to 200 radio units, with 3 built in relay switches it can trigger remote devices such as telephone diallers or flashing beacons; data is stored in the on-board memory and sent back to an attached PC running the FREE RIOTstation software; data can then be viewed graphically and the system administered. RIOTstation options include XD card logging allowing data to be logged over long periods without connection to a PC and a printer interface should you wish to connect a printer direct to the RIOT unit. 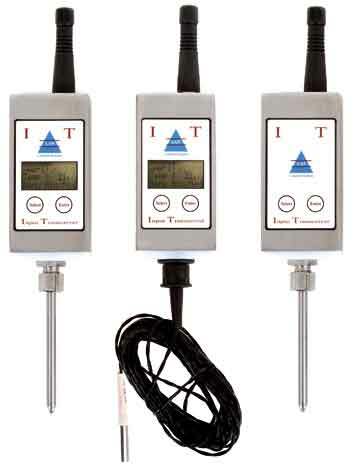 The RIOT hardware unit can accept Thermistor PT100, PT2, PT3, PT1000 and Woodley temperature sensors. Status and alarm signals from plant and process equipment can be connected via digital, pulse counter and 4-20mA inputs. 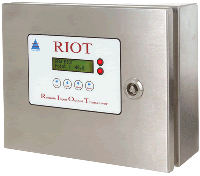 The RIOT panel also features as a WEB server and can be connected directly to the Internet or internal network. When combined with the AAW BATTERY BACKUP the RIOT can last up to another 12 hours after mains power is lost. 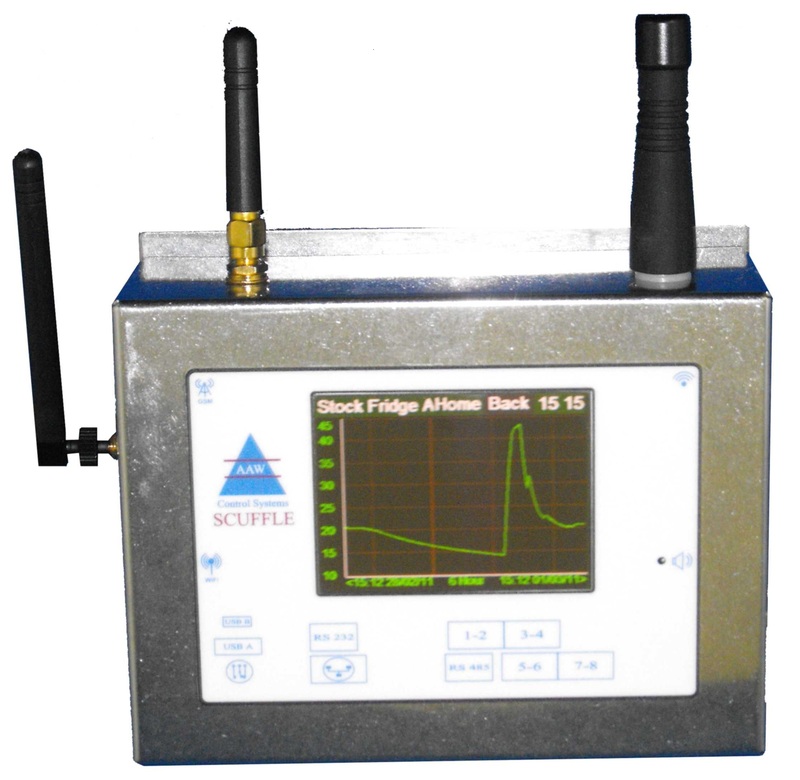 The SCUFFLE is our latest, most advance and versatile monitoring system yet. A SCUFFLE does not need a PC to have the same functionality as the RIOT, the SCUFFLE is a self contained, dual processor unit with a 71/2" colour touch screen, housed within a small Stainless Steel enclosure 105.5mm(H) x 50mm(D) x 139mm(W). The unit can communicate alarms though visual and audio signals also it can push alarm notifications using GSM, internet, landline networks. The SCUFFLE can push its historical data via its wired Ethernet port and/or its WiFi or GSM options back to RIOT Station software or a WebREACT server, so that the status, alarms, etc can be viewed and controlled via the internet with a PC and/or Mobile Phone. Designed for 2 basic markets – Advanced Auto-dialler and Temperature/Process Monitoring. The SCUFFLE has up to 8 wired inputs that can read multiple temperature sensors, Woodley 8, PT1, PT2, PT3, PT1000, PT100 3 wire (via separate hardware build), and 8 or more Thermocouples (via separate interface board), Humidity/Temperature sensor, Digital Status signals, any sensor with a 4-20mA output (X4) and it has a single NO/NC relay on the main board for connecting to a Building Management System or other devices. Within the next 6 months we are developing a GPRS module for tracking and other applications along with other modules like the thermal printer these run off the RS232 and RS485 ports. With an internal memory of 6 months and the ability to push this data via an usb slave to a memory key where a 64MB card would hold more than a years data. Our wireless temperature monitoring systems can span over multiple floors with hundreds of Information Transceiver units (IT's) addressed back to the RIOT or SCUFFLE radio hub. With the use of radio repeaters the wireless system can span multiple floors / buildings; each IT can have fixed or wired sensors and hold logged data for up to 14 days should there be a communication interruption but would ordinarily send it's data to the radio hub every 5 minutes, in an alarm condition the alarm is triggered instantly. AAW offer a wide range of IT units which include HACCP functions, remote relay and gas / flow detection, all units are designed and manufactured to the highest IP67 standards and are suitable for hostile environments, if you have a specific requirement please do get in contact with us as we have a great deal of in house experience and will be able to advise you on the best solution. In summary AAW can provide accountable monitoring of measurable variables for all process requirements; if you have a specific requirement we would be happy to discuss it with you. Use the LIVE CHAT at the top right of the page. Or E-mail your query to aaw@aawcs.co.uk.